Your essential cardigan from board meeting to night on the town: Joplin. 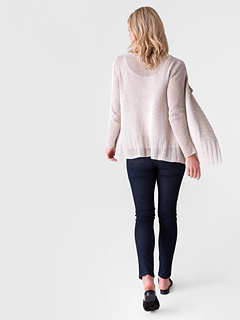 Knit in customer favorite Twig, you’ll never want to take it off. Joplin is a generously shaped waterfall cardigan or vest with a wide ribbing at the hem and subtly undulating reversible texture at side edges and collar. Joplin is worked flat in one piece from the bottom up, then split at the armholes for back and fronts. A wide collar is worked over the joined fronts and back. Optional full length sleeves are worked flat from the cuff up, then set in and seamed. Fabric may bias while knitting, but will block square to measurements.